Wheel profile used for medium and light units gravity lanes or for the lateral containment of handling systems. Particularly suitable for picking and stocking applications. The Medirail profile has been designed for easy installation of the 48 mm. diameter galvanized steel wheels type RSR 48 or the plastic material type RSR 131. This system represents the ideal solution for medium and light units gravity lanes or for lateral containment of handling systems. Furthermore it is particularly suitable for picking and stocking applications. The “click type” insertion characteristic allows the wheels to be easily changed and offers good access to the fixing bores; furthermore the wheels result in being firmly blocked and perfectly housed in the supports. The Medirail profile is made of galvanized iron sheet with 2496 mm. standard length and with a wheel pitch of 52 mm. or multiples. It is particularly strong as it results from the diagram that lists the load capacity in relation to the distance between the supports to be compared with the wheel load capacities. 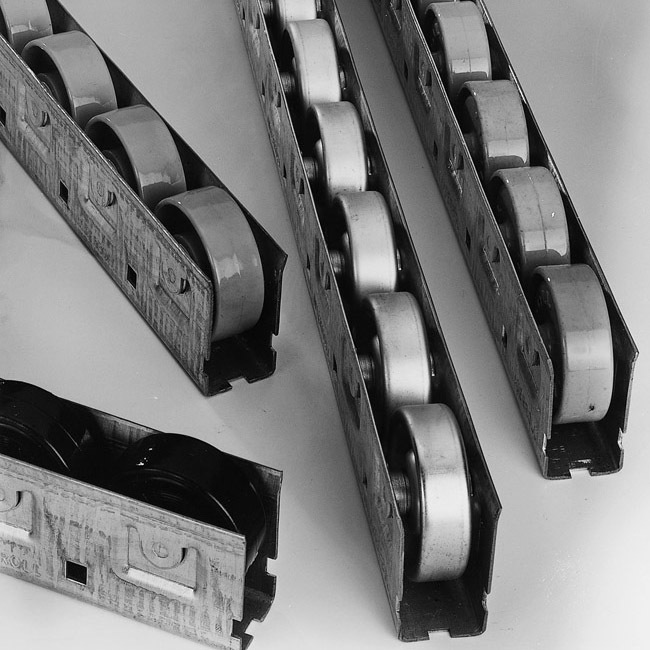 The Medirail profile can be supplied in lengths different from the standard, if the quantities required justify it.